The ruins of Castle Coeffin stand on the western shore of Lismore, a low-lying island in the Firth of Lorn. To get there, you have to walk a mile or so across fields that are bordered with stone walls, and if you’re blessed with good weather you will have far-reaching views over to the mountains of Morvern. 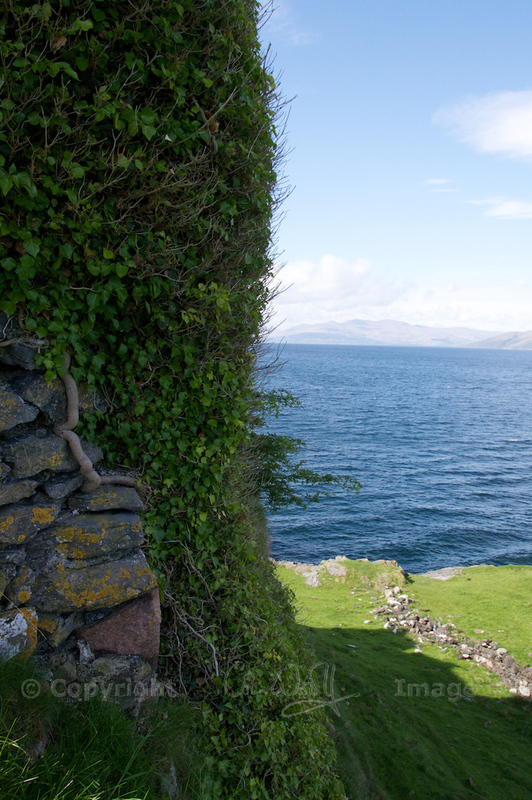 The castle comes into view as you descend a stony track, rising in the distance on a coastal promontory, its ragged walls almost entirely smothered in ivy. It seems to have grown out of the landscape. Below the castle crag, the waves curl gently into a shallow bay where beds of yellow flag iris and marsh marigolds are fed by clear-running streams. In May, which was when we visited, the grass is jewelled with bluebells, early purple orchids, bird’s foot trefoil and sky-blue speedwells. A quick scramble up the steep slope and you’re standing within the castle walls. The stonework is still impressive: huge blocks of pinkish granite, with smaller flat slabs wedged in layers between them. Grass and thrift cover almost every surface, and a small hazel tree sprouts rakishly above a doorway. Primroses speckle the grass, and land snails feast on the lush carpet; even if you’re enchanted by the scenery, it pays to watch where you put your feet! So what went on here, in this windblown, deserted, ridiculously romantic haven of a place? History tells us that Somerled, the 12th century Gaelic-Norse warrior whose bravery has made him half-legend, half-man, divided his kingdom between his three sons. The eldest, Dubgall or Dougall, received lands in north and mid-Argyll, as well as the islands of Mull, Tiree, Coll and Lismore. From him sprang the clan MacDougall. (His younger brother, Ranald, received Kintyre, Islay, Jura and Colonsay, while a third, Angus, inherited land in Ardnamurchan and north-west Scotland). 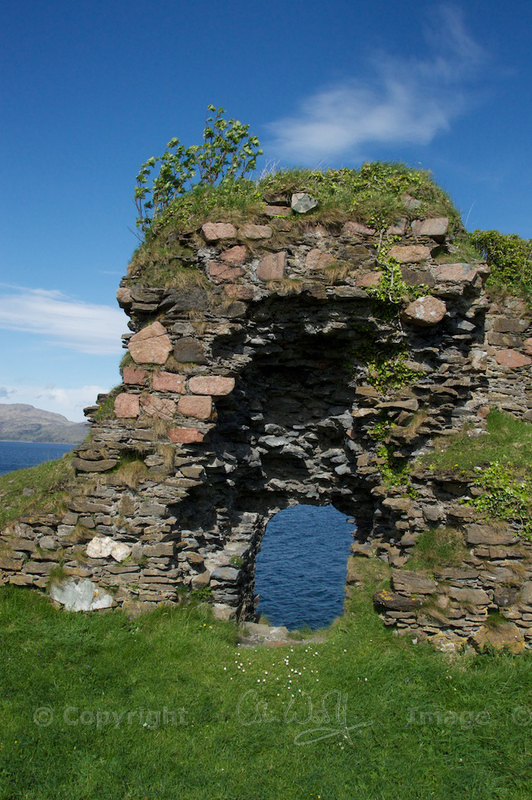 After Castle Sween, which was the first stone-built castle of its kind in Scotland, a rash of new fortresses began to arise between 1200 and 1250. In structure these resembled the formidable castles favoured by the Normans, with massive curtain walls protecting a square tower within; and among them was Castle Coeffin. Built by the MacDougalls of Lorne, it was situated conveniently close to the ancient cathedral of St Moluag. Some sources say that the hilltop site was already a Viking fortress, and although this is not mentioned by the RCAHMS (Scotland’s authority on ancient monuments), it looks to be an ideal spot for such a stronghold. “In the days when Coeffin was a Norse stronghold, Beothail of the golden hair lived there. She was very much in love with a young Viking warrior. When in far-off Lochlann [Norway] this warrior was killed, Beothail grew pale with her grief and died. Then in the wind that buffeted the walls of Coeffin came the pleading voice of the dead maiden begging her father and brother (whose name, by the way, was Caiffen or Coeffin) to carry her bones to Lochlann. Finally, her bones were washed in the sacred spring of Saint Moluag (still called Tobar Cnamh Beothail, “Well of Beothail’s Bones”) at Clachan and, thus blessed, were carried to where Beothail’s lover lay buried. The last paragraph is so strangely true, because as I stood in the walls all I could hear was the breeze as it passed in waves over the ivy leaves, making a silken whisper like someone sighing. Occasionally a yellowed leaf would fall silently at my feet. Today few discernible features remain, and it needs a certain amount of imagination to picture the castle as it was. It would have consisted of a hall-house, oblong in plan, its walls almost eight feet thick. An irregularly-shaped bailey, itself surrounded by a wall, protected the main entrance. Archaeologists have discovered the remnants of a fish trap below the walls, along with a small quay; the bay had apparently been cleared to make boat access easier. I didn’t see evidence of this, but I wouldn’t necessarily have known what I was looking at. The castle changed hands several times before passing to Sir Colin Campbell of Glen Orchy. Despite its strategic situation with a well-sheltered anchorage below, it seems to have stood derelict for many centuries. The RCAHMS considers that “…there is no evidence to suggest it was occupied in post-medieval times.” Perhaps we should be glad of that. Take a look at Castle Sween, further down the coast on the shore of Kintyre, considered to be Scotland’s earliest stone-built castle; or Skipness, overlooking Kilbrannan Sound towards the island of Arran. Wonderful tale – in some places you can easily believe the legends. It looks so beautiful. A magnificent post full of glorious photographs. I feel as if I’ve had a spell cast on me. I hope you will return in the mist some time and report back, because I’d love to know if the veil is thinner in spooky weather. What a wonderful tale & some great pictures too. You were blessed with glorious weather as well. I was just enraptured with the whole place, and the story – and the weather really blessed us, as you say. The views were amazing! Love to go there one day! Suzanne, I hope you do – you will love it! Thanks so much for stopping by and commenting. 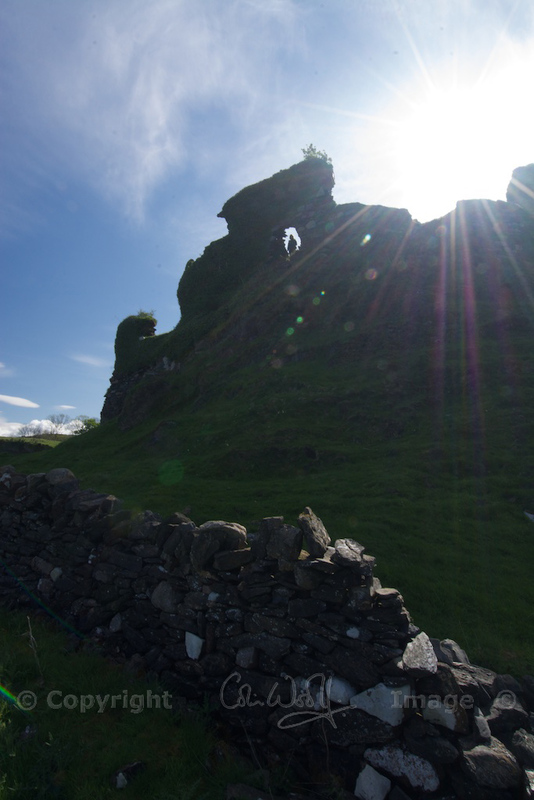 Lovely pics of the castle …lived on Lismore for 2 years until recently ……Beautiful part of the West Coast. What a beautiful place to live… we felt as if we could happily live there ourselves. Thank you – glad you liked the pics. There’s nowhere like the west coast and the islands! They have a special place in my heart. Yes they are Jo…………..and sunsets and snow capped mountains to die for! Blue and green, sky and grass! Like them all! Lovely! Thank you for sharing. Lismore is where my ancestors (Carmichael) came from. I am hoping to get there next summer. Love all the angles of the castle you took. So glad you enjoyed it – thank you! What a lovely place to have as part of your family history. Hoping you have a fantastic time! What a wonderful place and lovely stories too. Photos outstanding as usual Jo and this is looks like a place I would love to visit. Truly beautiful and makes me feel truly proud of my Scottish roots. Jo this is beautiful, and crying out to be put in a poem. I’ve saved the quote and some of your words, and hope you don’t mind if I play around with it. You are most welcome, Viv, anytime! 🙂 Glad that it inspires you – it’s one of my (many) favourite places. I was thinking about camping beside the castle, but I see on google earth that there is a farmhouse nearby. Do you think that camping would be possible beside the castle? There is a wonderful poem about the Norse princess you talk about in the book “Lismore in Alba”. It is of course in Gaelic but has been translated also. Let me know if you want me to send you a copy.